In all its activities Hendrikson & Ko is fully aware of their social responsibility related to carrying out these important tasks. We see how, for example, drawing up a general plan or evaluating the environmental impact of a new motorway, will have a direct and long-term influence on the quality of life of a great number of people, but also the quality of life in a given area, economic options, and other important assets. Public and general interests are vital aspects of our work. We have set an idealistic goal of helping to make the world a better place, today and tomorrow alike. In our work, it is essential for us to comprehend our client’s needs correctly in order to tailor the work process and goals to it. What is important to the client is important to us. At the same time, we will transpire any circumstances where planning or environmental solutions will bring about long-term negative outcomes or will go against public interest. We offer to our clients the best solutions and options, work efficiently and work fast. In a case of a conflict of interests or insurmountable contradiction to public interests we cannot promise to pull through with the project, yet we will work out a constructive solution for the client. Our staff’s superior know-how and company’s synergetic know-how, based on education, additional training, and hands-on experience, will guarantee the high level of our work. By continuing to acquire new knowledge we can guarantee the use of best practices and latest methods and technology. In out work we use first and foremost up to date computers, printers, servers etc. and professional level software (GIS programs, noise and pollution modelling, visualizing software etc.). All this is the basis for innovation both on the abstract level of the outlook and for applying the tangible innovative solutions, but also for developing them in the first place (project e-com, for example). We carry our quality control to rule out any mistakes. We take responsibility for the work we do. In all processes, we strive to produce results in a smooth and flawless manner and on time. We understand that in our work we will be in possession of information which the client needs to be kept confidential. We can assure you that any sensitive information will be only used to the extent necessary for our work and will not allow it to be accessed by third persons. employee’s wishes relating to working times, workload, training and other similar issues are considered as much as possible. we avoid or reduce the usage of paper when we offer our services or manage the office. The efficiency of these measures is regularly assessed. The company’s management puts out goals to realize our quality policy and through fulfilling them, ensures that the managerial system keeps improving. Employees are constantly being trained and educated in order to fulfil the quality policy. 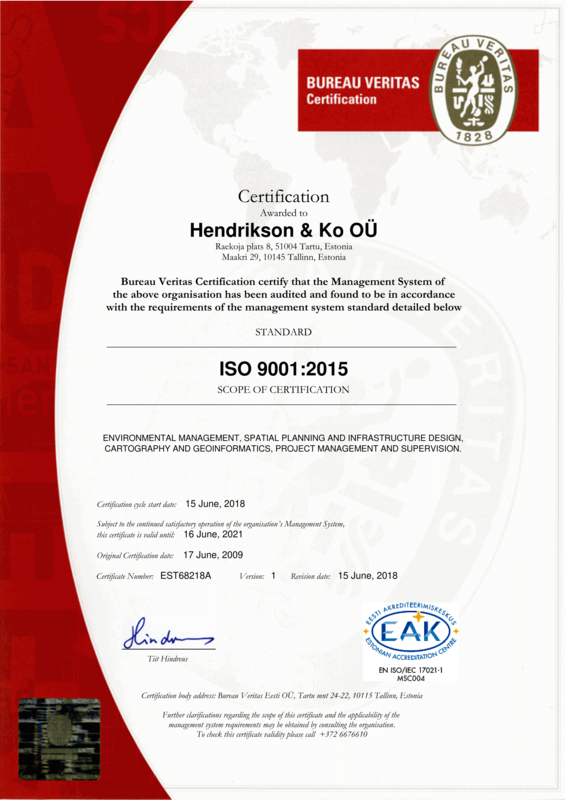 Hendrikson & Ko´s quality management system is certified according to ISO 9001: 2015 standard.